Quilt 4: "It's All HAPPENING!" Merry Christmas! Christmas Day is over. I enjoyed myself immensely and hope you enjoyed your day, too! 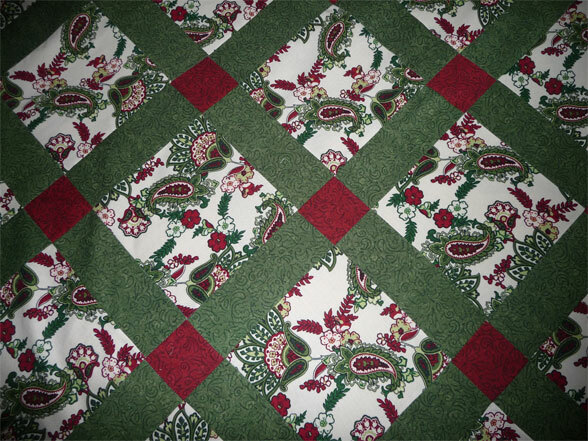 Of course there was never any hope of getting this Christmas quilt done before the big day, but that's OK. 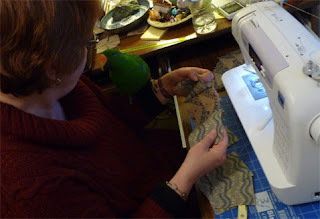 I'm still working on it, and just enjoying this special holiday project to the MAX! 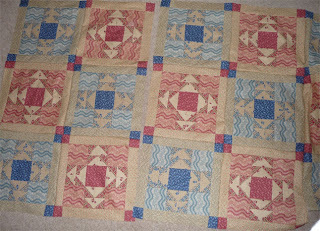 Now that the center has been pieced together, all I have to do is add the border strips and we're there! 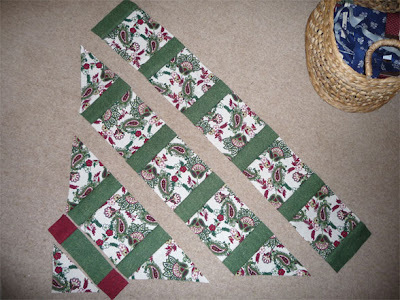 Here we go - first two borders (narrow green band followed by a wide red band). 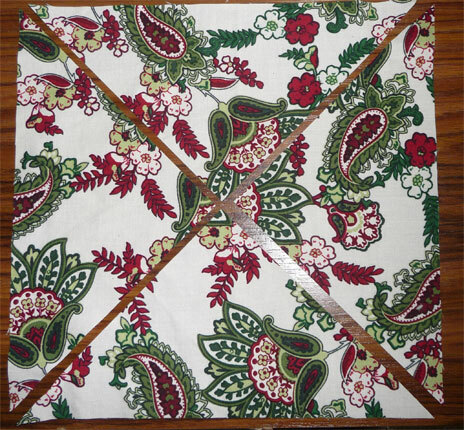 Note that the red border has squares of the paisley print set in the center and on the corners. 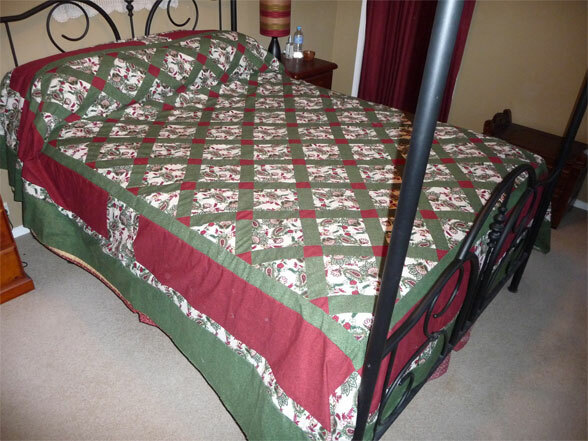 But the proof is seeing it on the bed (below). I did alter the design slightly. I opted to keep the border at the top a little less wide. I didn't need it to be as wide as the bottom and sides. Our bed has a latex mattress - quite thick - so I've had to make this quilt a "super-sized" queen - it's really almost a king size quilt, with the extra length added for the sides and bottom. All set! Next: sandwich and pin! I've got the pieces for the on-point lattice in the center of the quilt, and am starting to lay out the strips. 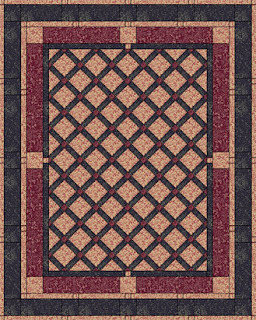 Shown below are the corner piece (for the lower left), then the strtip of green and red lattice, then the next diagonal "row" and so on. 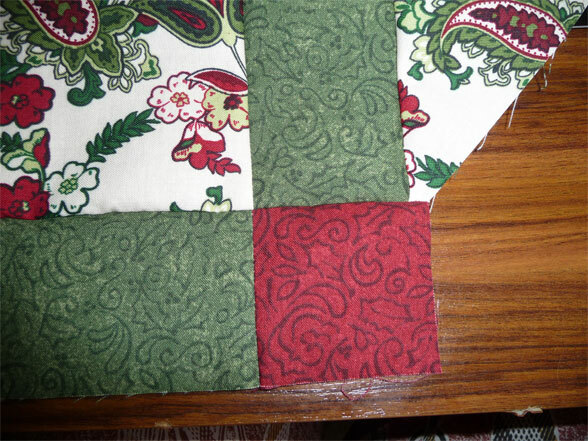 As you can see in the picture above, I've not cut triangles for the edge of the lattice - but instead just cut a square, and will sew the first border (a narrow strip of green) on top, and then will crop away the excess. 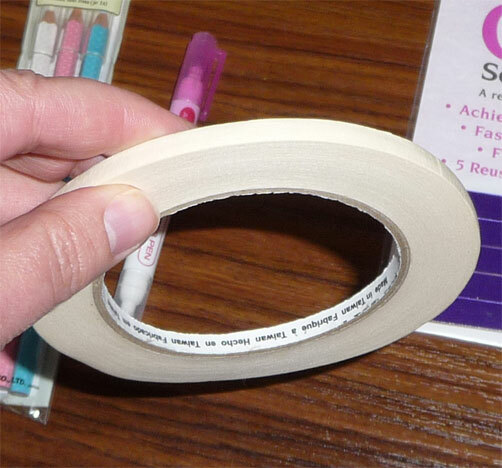 Just seems easier than cutting itty bitty triangles and fooling with them. I have to be honest and tell you that although I thought assembling this section would be pretty simple, it actually wasn't. 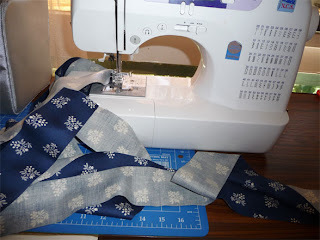 I kept messing up and sewing the wrong strips together. 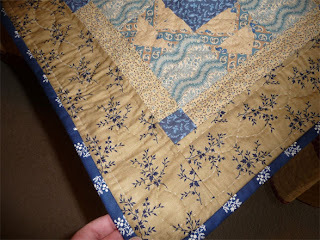 I'm afraid I used my seam ripper quite a bit on this one, and had to redo several bits. Was I rushing too much? No, just managed to get confused. But the on-point center is done now (closeup below) and I'm really pleased with hot it's coming along. Now to get busy and put the borders on. 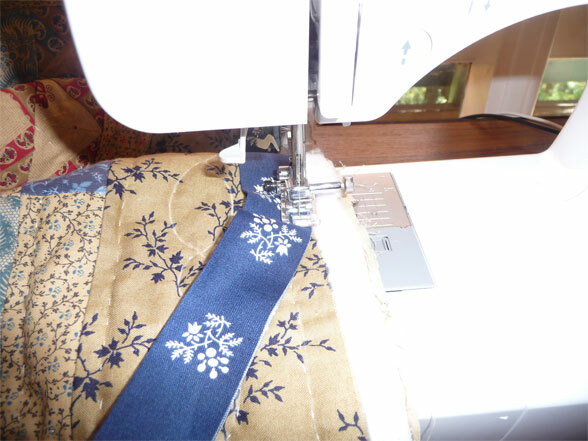 They're mostly just wide strips of the three different fabrics, so it probably won't take long. 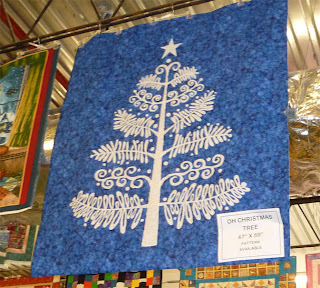 Back in June of 2010, I found a nice Christmas print in the clearance rack at a favorite fabric shop. 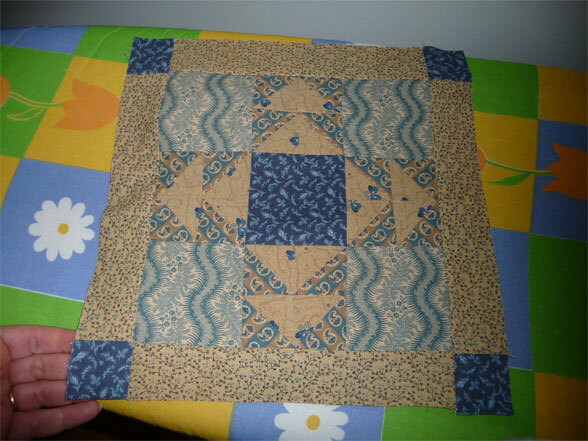 I grabbed it and, with help from quilting guru Pauline, found a couple of complimentary prints to go with it. 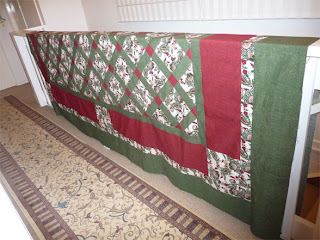 I put up a post on this blog to share the design and my plans for a queen-size Christmas quilt. 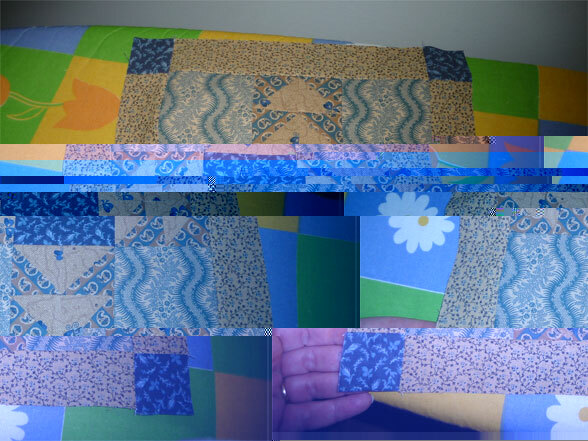 What happened to quilt 4? Well... uh... it just never happened. Truth is: I felt intimidated by the on-point design. I just wasn't ready. 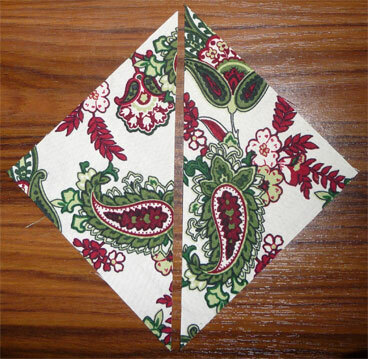 2 squares of paisley (5 1/8) cut in half to give me four triangles. (above) for the corners. 5 paisley squares (9 3/4 inches square) cut (as shown below) to produce twenty slightly larger triangles for the edges. There needs to be red triangles for the edging, too... but hm... I think I'm going to try and "cheat" there - more about that later. 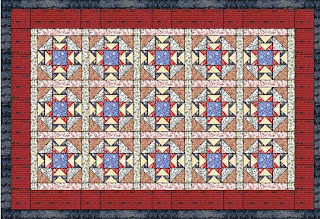 Quilt 14: Civil War Prints - DONE! 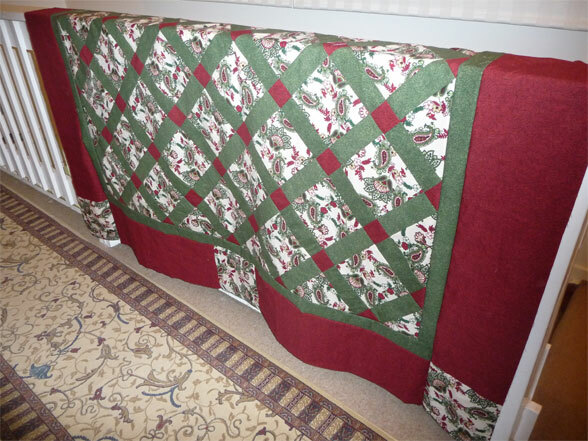 Here's a photo of the completed project, with the back flipped at the bottom so you can see the backing fabric Julie selected. I think she chose very well, don't you? And here's a detail photo of the corner, so you can see the border and binding together. 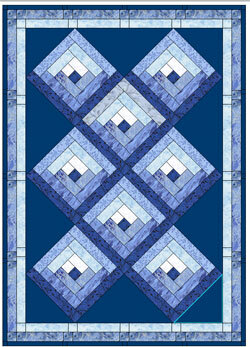 The border picks up the tans from the inside blocks plus adds a splash of navy - very nice! And the binding is something of a "negative print" of the border. It's been quite a while since I actually finished a project; I've been going through a bit of a dry spell - but hey! Here's one that's done and I'm feeling pretty good about it! 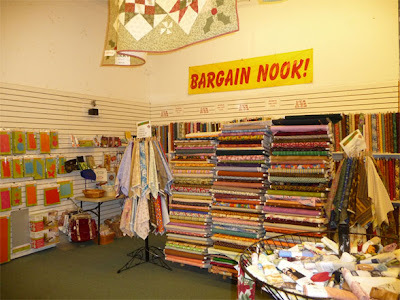 I do have one other project in the quilting stage - so there's no danger of "quilt withdrawal syndrome", but I'll also start looking at the multitude of projects still in my UFO closet and select the next one to attack. One of my favorite shops - Foothills Fabric and Threads (in Tecoma) - is closing down today. I will miss them greatly. 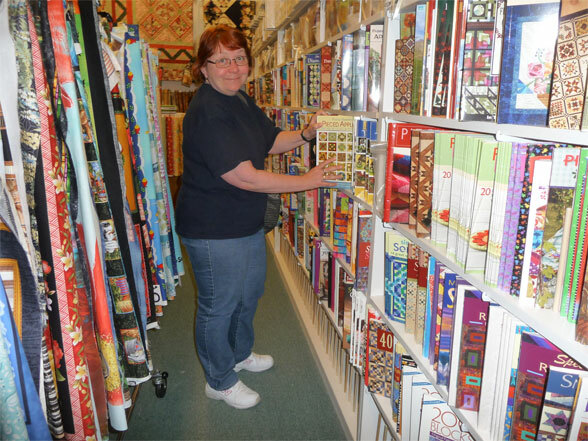 I've gone there several times since launching into my quilting mania, and found lovely women there who've been encouraging, supportive, helpful and well, just really nice people. There's you just can't beat shops like this one - they had an excellent selection, reasonable prices, and the staff - well the service you get in a place like that is hard to beat. So - to the owners and staff - farewell and best wishes for the future. Your shop will be sadly missed. ...it's applique. I'm just not ready for applique, and even if I was, this doesn't look like a good "beginner" project. So I passed it by. Of course... hm... 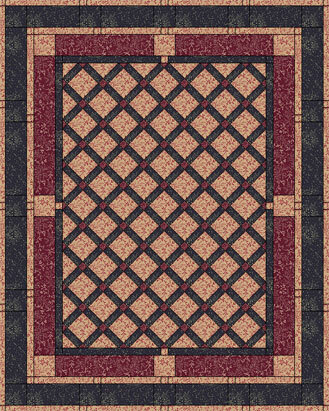 I COULD order the pattern. Surely shipping just the pattern from the US wouldn't be expensive. I adore the colours - the browns, peaches and blues. 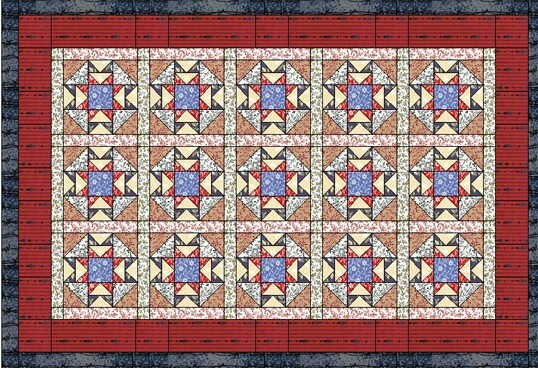 It's a queen-size spread done with civil war prints. I just fell in love with it. I studied it a bit and am pretty sure I have the skill now to tackle it. So what stopped me? 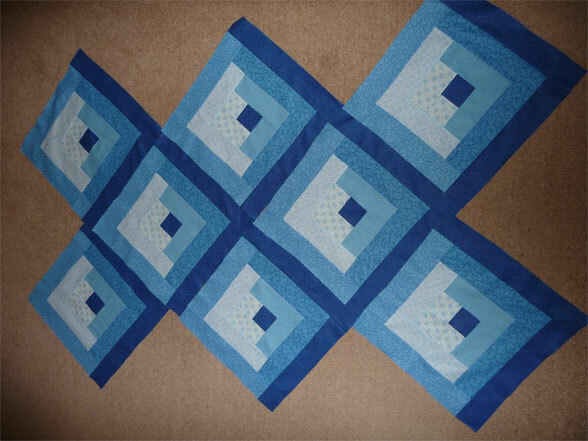 Well - it's a "block of the month" project. I just couldn't see getting into something like that when the shop is in Florida and I'm in Australia. No.. no... no... I'm not going to. 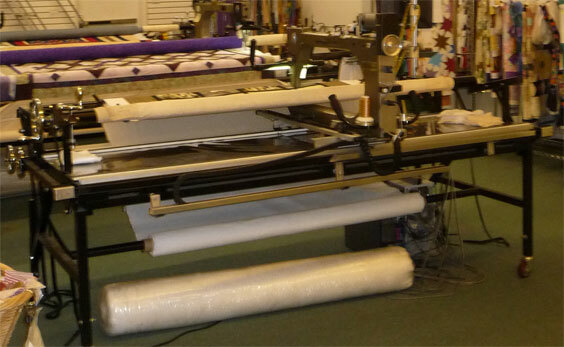 It's a "longarm" quilting machine. In addition to all the fabric, books, patterns, and doo-dads, this shop also offers professional quilting. Oh... what a fantasy! Think about it! Wouldn't it be GRAND to have one of these babies? OOOOOO! 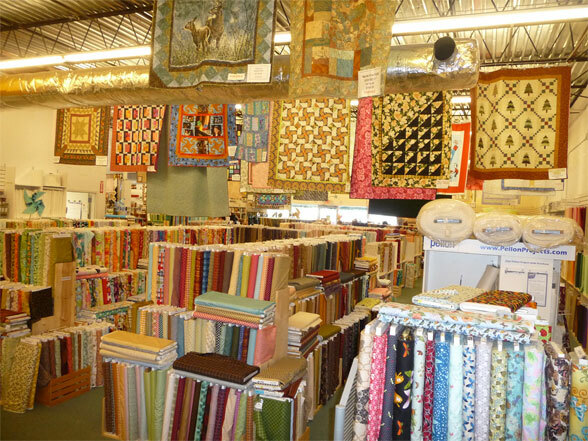 I makes my head spin to think how FAST I could crank through my UFO closet and churn out heaps of lovely quilts at lightening speed. Now, to be honest, I do think there are some quilt designs that just look nicer hand-stitched, even with my horrible, sloppy, fat stitches. But then again, I've seen so many that look lovely with tight swirlees and machine-done patterns. After the smelling salts revived me, I decided that when I win Tatts Lotto, I'll get one. Of course I'll have to buy a new house, too, as there isn't really any place here to set up such a huge working area - but with Tatts Lotto winnings in my bank account, maybe I can convert our garage into a workroom and put my long arm in there. Along with an armed guard. 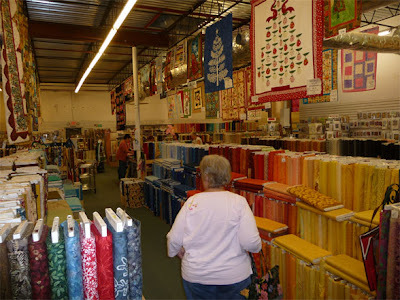 The shop is called "The Quilt Place", and it's huge, simply huge. 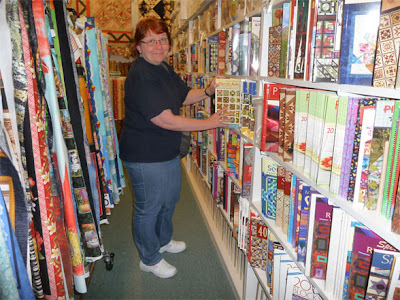 I'm trying to decide if it really is bigger than my favorite local shop here in Australia ("Patchwork With Gail B") - or if it just FELT a lot bigger. I'd have to say it's at least 50% larger than Gail B in terms of floor space - and that's saying something. Well- they have more books, that's for sure. Here I am (below) standing next to a book wall that is close to half the length of my house! We tried to get a photo of the whole wall, but it's just too big. Just behind me is rack after rack of panel prints. On the opposite wall in this wing of the store (yes... 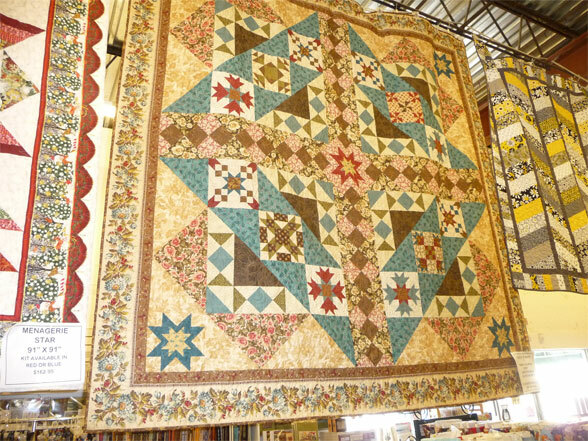 I said "wing") is an equally huge display of quilt patterns. Look at the price list (below)! 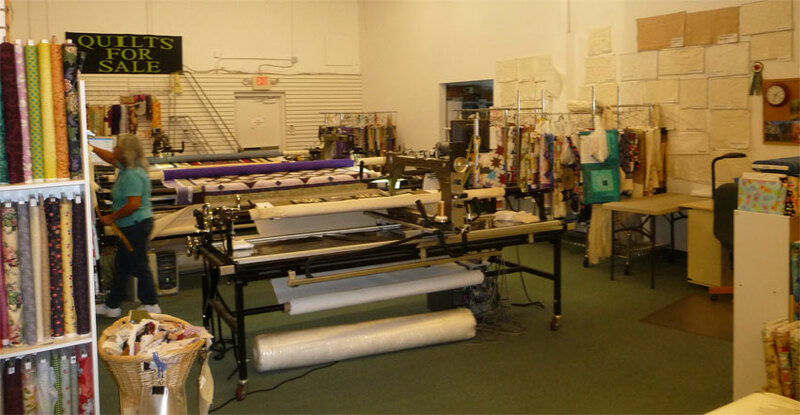 Now you'll be wondering if the fabric they've got in this clearance area is junk... well, no... let me tell you, I saw a couple of prints in that stack which match some prints in my UFO closet (and not fabric I've had long) that I paid about $20 per yard for. Poor Cousin Toni - she wore out long before I did. Fortunately, there are chairs near the front of the store - so she had a seat and just let me run wild. And did I run wild? Dear Liz, You appear to be falling down on the job. You have promised to update both of your blogs on a weekly basis. I have been faithfully following you for quite some time. The past few weeks I have been sadly disappointed to find no new postings. Have you fallen ill or are you just a slacker who is leaving your fans in the lurch without even a fare thee well? I am inclined to give you the benefit of the doubt, but I could change my mind at any time (you never know what these Internet stalkers may do when deprived). I also have access to your home address and could possibly start some deliveries to express my displeasure. Since I am an anonymous stalker you should beware and make a new posting posthaste. Well, good and faithful reader - you have been heard. 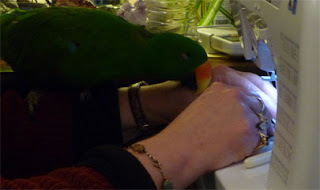 My thanks to you for your loyalty and for giving me a gentle and loving "nudge". 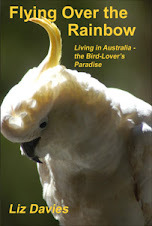 I just finished checking my visitor stats on this and my other blog - and am delighted to find that although I did lose a few folks this past few weeks, many are still checking back on Wednesdays. So,OK, I'm back in the "saddle" and I've got things to share. Thank you all! "What a FABULOUS idea," I thought. I was in a local quilting shop looking for quilt tools and, well, it really DID seem like a great idea. 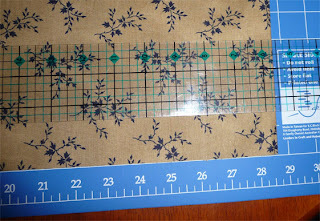 A small roll of masking tape cut to 1/4 inch - you could lay this on your quilt and use it as a stitching guide. Yeah. Brilliant. Have I used it yet? Well, no. Why not? Well... mostly just because I don't really care all that much if my stitches wander just a bit. I like my "rough hewn" style. So this lovely roll of tape sits in my tool box and may never be used. Happy Birthday today to my neice Audrey - she turns 5 today. I'm planning a trip to the US soon and will be catching up with her. 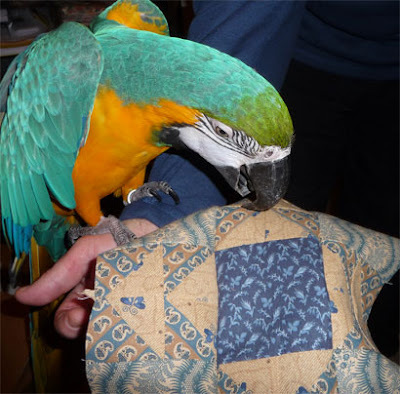 She's a little young for quilting, but even at 5 has shown some interest - and it's terribly sweet. You see, my mother has moved into a retirement unit, leaving her big old house forever. 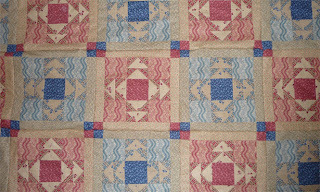 As part of the move she had to get rid of a few things, including some quilts. 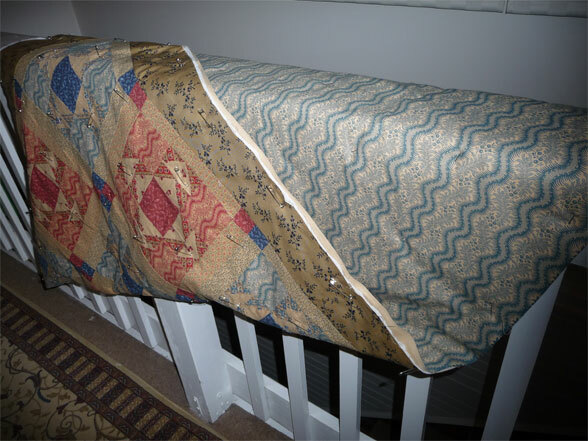 My sister-in-law tells me that little Audrey adores her grandmother's quilts, and has asked to keep them. Now is that sweet or what? And me... 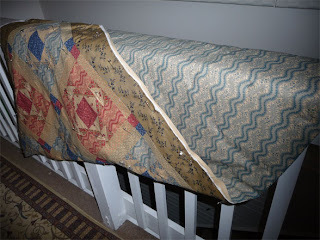 I'm seeing this as a sign that little Audrey has inherited the "quilting gene" (which was the subject of my very first post on this blog). Good onya, Audrey! And happy birthday! 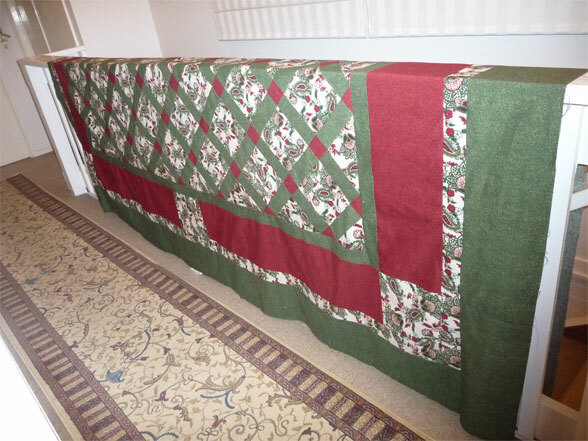 After assembling the top for this quilt, I sat down and thought long and hard about how to stitch it. 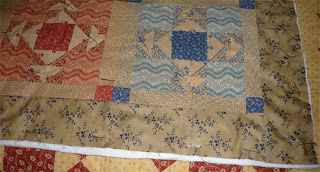 Here's what the top looks like (closeup of a couple of the blocks). Lots of different ways to go at this, but I finally decided on outlining each block (stitching about 1/4" around the edge) and then doing a kind of diagonal zigzag inside. 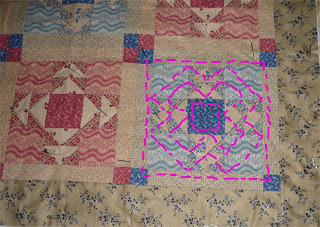 Here's a rather rough idea of where the stitches go (in hot pink). So far, I'm happy with this. I've done 3 of the blocks and it works pretty well. Unfortunately the pattern simply isn't visible on the back (which is blue/cream wavy print) because the cream quilting thread just isn't bold enough to show through. I'd thought about using thick thread or even embroidery thread for the quilting, but decided against it. I don't want the stitching to draw too much attention on such an elaborate top. 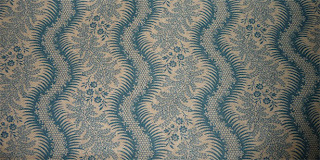 The print is almost a negative reversal of the outer border fabric -except that it has white where the outer border has only tan. But when we held the pieces up together, well... It fools your eye. 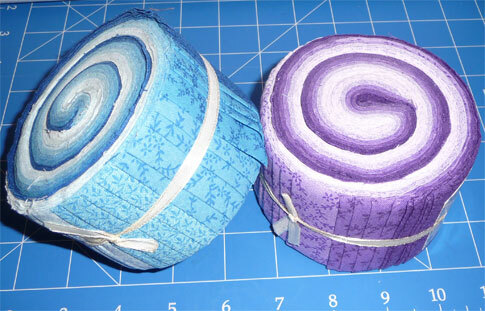 I've already made a few changes to the design (with Julie's approval) but am finding one more that seems wise: the borders in the original design (the large band on the outer edge) was originally to be red. But... hm... No. 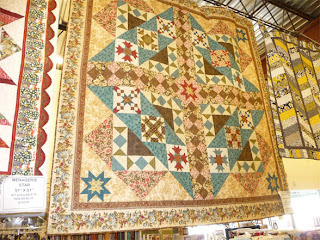 We had the top with us at the time and agreed it would be a nicer, more subdued border instead of the red border. And here it is, sewn to the edge of the original top. This photo makes the colours look a little off... but that's just the camera. The border actually melds really well - definitely better than the red would ever have been. I think she chose wisely and, as you may have noticed, this print is in the blue blocks on the top - so the theme is transferred to the back. The only problem I saw with her choice of backing is the fact that this wavy-line print would be IMPOSSIBLE to use if we had to have more than just one width of the callico. Those wavy lines would NEVER match up well. Fortunately, the width of the callico suited her as a max width for the quilt - and so off we go! I've tried everything - ironing it, laying heavy books on it for days on end - just everything, but nothing is smoothing it out. I've been using it anyway - limping along - but have to admit it's driving me up the walls. That bend in the middle makes it hard to keep longer pieces squared up. So... I'm giving up now - going to retire this one and purchase a new one. 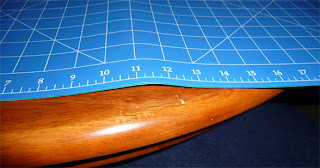 I hate to do that, as cutting mats are pricey - but it's a tool that I use quite a lot, and having one that isn't up to scratch is making me crazy. Yup - you are right. 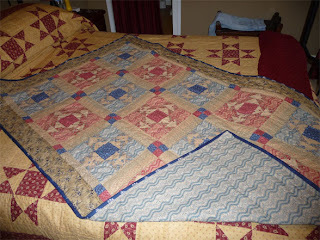 3 strait weeks now, and nothing about quilting. As a matter of fact, here it is: THURSDAY and I'm only just putting up my Wednesday post - and a pitiful one it is, too. A big "thank you" to my loyal followers (and esp. quilting guru Pauline and soon-to-be quilt-a-holic Jen) for sticking with me during this rather dry period. Next week: I'll get my act in gear. 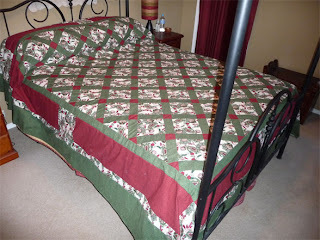 Last week I allowed myself to have the momentary fantasy that quilting would be a good cure for high blood pressure. 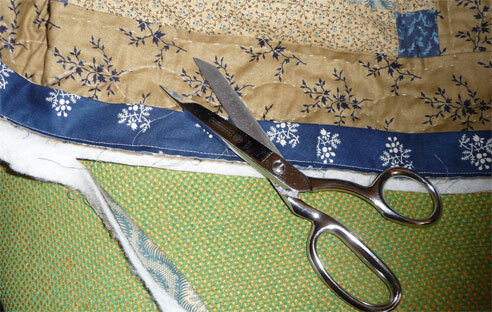 Well... quilting can be relaxing, which is good for blood pressure, but it won't, by itself, overcome the effects of having been VERY sedentary over the past 2-3 months. 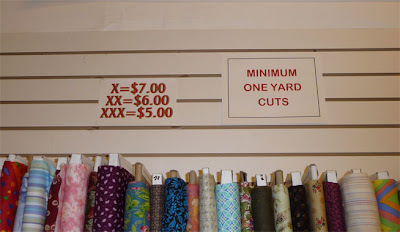 So... Looks like I'm going to have to (gulp) set down my needle and thread from time to time and (gulp) EXERCISE! So OK. I am no longer in denial. I now solemnly promise to perform exercise - either walking (preferred) or riding my stationary bike (much loathed) - every day. SPIDER SOLITAIRE on the computer! I'm never going to love this bike, but Spider Solitaire will make it bearable - at least for a while. 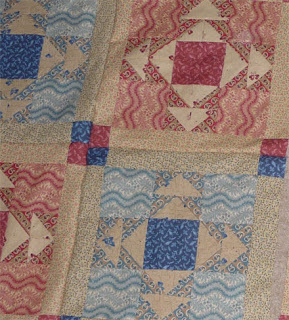 I went to Spotlight with a friend to pick up the binding and backing for her quilt (the American Civil War prints) and took along one of the blue log cabin blocks so I could get the fabric needed to finish that one, too. The store we went to is down in the city - about an hour's drive one way (that's where my friend lives). I came home and today (3 days later) realized that I must have left that block in the store at the cutting counter. I can't believe I did that. I just can't believe it. Only $4 each! Who could resist? 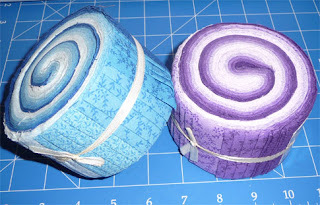 Now, I'll grant you, there's not a huge amount of fabric in these rolls: 25 strips 2.5 inches wide and 42 inches long - that comes to about 1.5 meters of fabric, not a huge amount. Still... $4? Gotta have 'em for that. 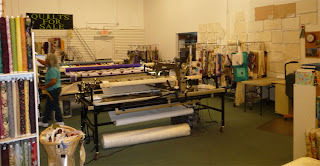 ...6.5 yards of fabric (42 inches wide). 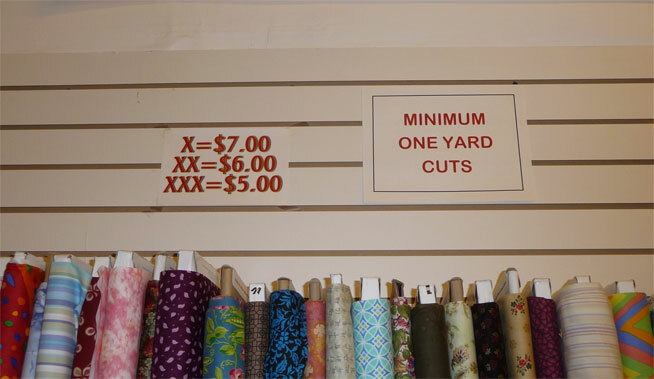 I think 1.5 yards should be more than enough. 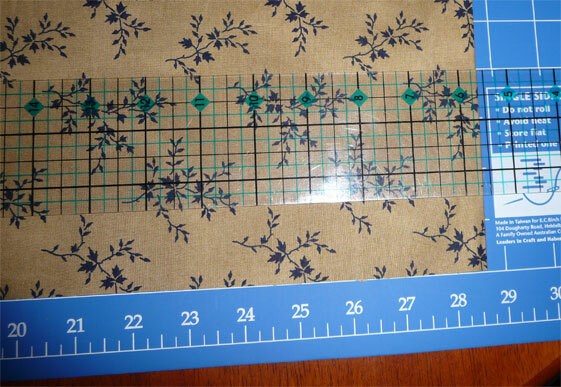 I do like the cutting instructions the software gives, however, and expect the measurements the software gives me for the individual pieces should be OK. 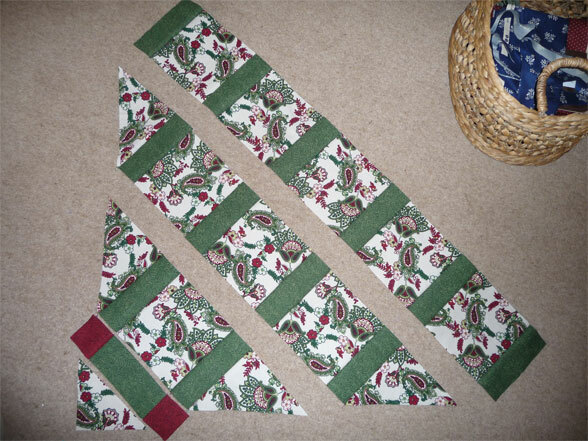 I've got plenty of left over jelly roll strips to make a couple of nice borders and the binding, but I'm off to the fabric store to get what I need for those triangles to fill in the log cabins. 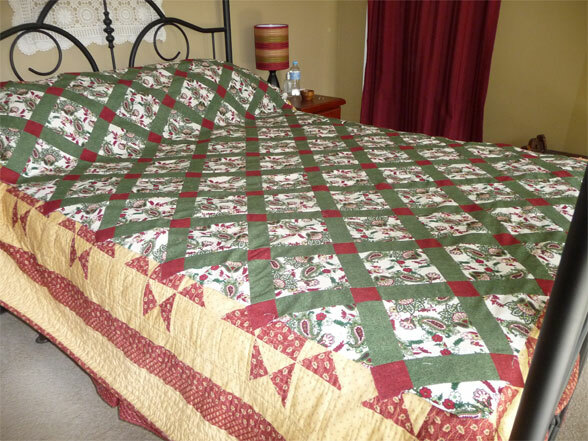 Quilt 14: Let's Play "Spot The Goof"! 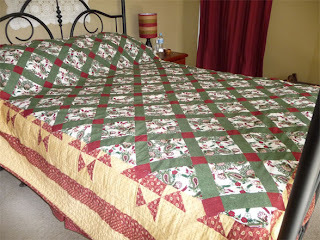 In many ways, this quilt has been one of the most satisfying ones I've done. However... it's also been a bit challenging. Two of the prints have stripes. They are lovely, but stripes, I'm finding, can be a little challenging because you need to make sure they are running in the right direction. As I was assembling the little triangle blocks, I had more than one occasion where I got the lines going wrong and had to pull the blocks apart and re-do them. I was ultra careful as I assembled the nine-patches, however, and got it right every time. I won't kid you; it wasn't easy... 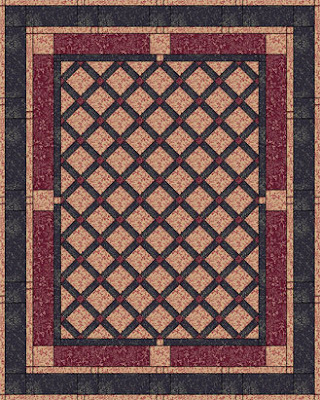 I had to really pay close attention so that the corner squares on those 15 nine-patch blocks all lined up right (there's a wavy stripe pattern in the corner squares. 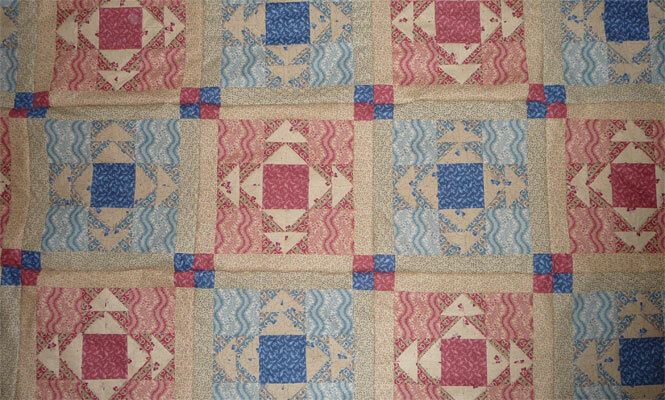 Here's a closeup...see the direction of the wavy pink lines vs the wavy blue ones? Oh, nooooo! They should be going the same direction. 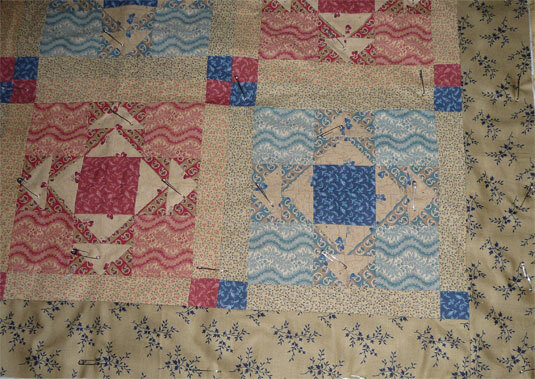 And now here's the re-assembled top - with all the wavy lines going the right way. And I'm happy to put this painful episode behind me. 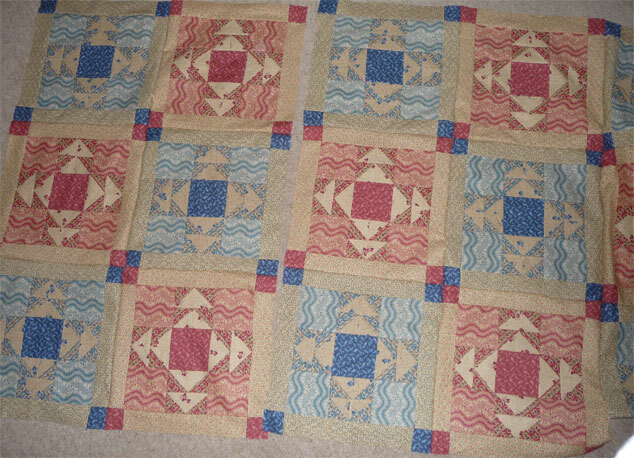 I've finished piecing the blocks for the quilt, now into pressing them. 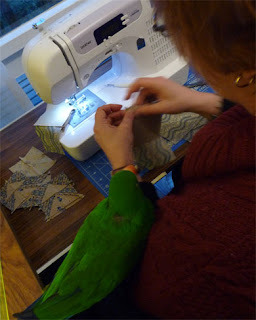 And not to be outdone by George, who was my "supervisor" last week, Miss Laka is here to inspect the stitching. Unfortunately Laka isn't content to sit on my shoulder and behave herself as George did last week (well, as he did for a while, any way). She's way too "busy" to have around when I'm trying to get something done, and her idea of "help" would, no doubt, include chewing a hole in the middle of the blocks - so I had to send her packing. I'm pleased with the blocks, however - here's one of the blue ones after pressing. 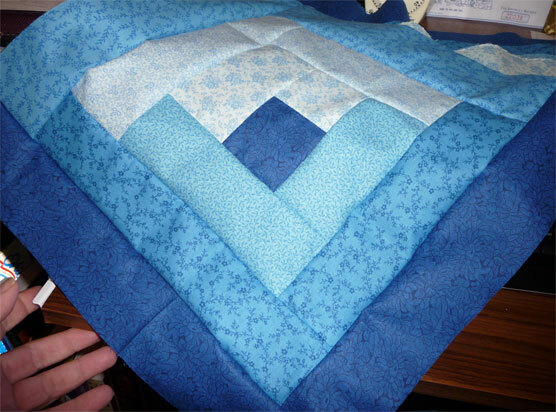 I added narrow border around the nine-patch block, using that dark blue from the center on the corners. The original design didn't call for those little squares on the corners, but once I'd finished the nine-patches I realized that the dark blue in the center needed to be repeated somewhere. Thankfully, there was just enough fabric to do it on all 15 of the nine-patch blocks. 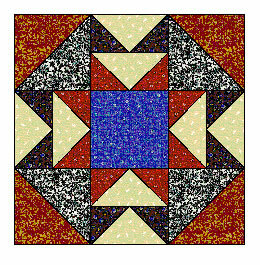 As you can see, I've also altered the design to have the triangles pointing outward from the center - and the corners inside the nine-patch are solid squares instead of joined triangles.